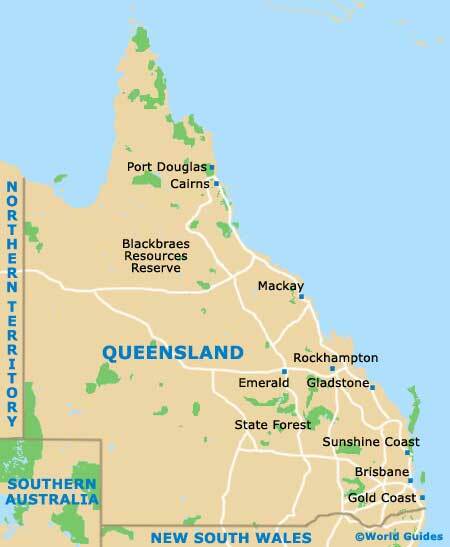 Sitting tall and proud in the north-eastern corner of Australia, Queensland is one of the most enigmatic of the country's states. It is almost impossible to pigeonhole Queensland into any one category, because this is a place of so many different landscapes. The Gold Coast is home to some of the state's best-loved beaches, glorious golden affairs that never fail to dazzle. This lengthy coastline is also sometimes known as 'Australia's theme park capital'. Thrill-seekers can step straight off their surfboards and choose from no fewer than five major amusement parks. In fact, there is no shortage of ways to get your adrenaline rush in Queensland. Scuba and snorkelling opportunities abound in equal measure. Offshore from the dream tourist town of Cairns is the Great Barrier Reef, which stretches along the northern coast of Queensland. The nearby Whitsunday Islands, with their idyllic white beaches, have an added attraction from May to September in the form of migrating humpback whales. Queensland's biggest city, Brisbane, hasn't always been top of the tourist destination list. It has pulled itself up the hard way from small underrated town to cosmopolitan wonder. Live music, art galleries and a cafe culture to be envied are the norm in the city today, although its relaxed attitude to life hasn't been totally forgotten. Inland, the tranquility of rainforest-covered mountains makes a refreshing contrast to Queensland's busy coastal scene. If you fancy peace and quiet, a trip to the Bunya Mountains should do the trick. This distinctive series of peaks is known for its abundant wildlife and magnificent views. Whilst the landscape may vary wildly, the weather tends to stay disarmingly similar. It is quite apt that Queensland is known as the 'Sunshine State'. Almost all-year round sunshine is guaranteed, with temperatures usually rated as warm, warmer and really quite hot.